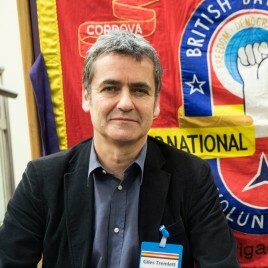 Giles Tremlett is a journalist, author and historian based in Madrid, Spain. He is a Contributing Editor at The Guardian - writing literary criticism, reportage and political analysis. He is a Fellow of the Cañada Blanch Centre at the London School of Economics and Political Science. Giles previously wrote for The Economist. He also occasionally writes in El Pais, El Mundo and is a regular commentator on Spanish television. He is the author of three non-fiction books and biographies which have been translated into seven languages: "Ghosts of Spain: Travels through a country’s hidden pas" (2007), "Catherine of Aragon: Henry's First Queen" (2010), and "Isabella of Castile: Europe's First Great Queen" (2017). He has lectured or contributed to seminars at universities across the world, including Oxford, Stanford, MIT and La Complutense.